By Marie Hablitzer and Kim Stitzer. A drawing and handwriting course for kids. Colorful, easy-to-follow drawing lessons, text for handwriting practice, theme-related questions, answers and book lists for further study. Twenty-four lessons, plus teaching tips on how to employ particular techniques. Ages 5-8. Animal Habitats--Land, Ponds, Rivers and Oceans. 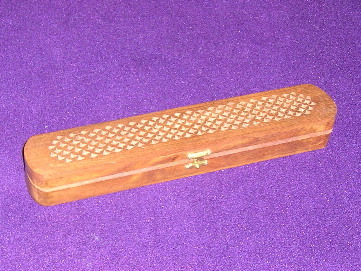 This is really an incense box, but we use it to keep track of paintbrushes. After five years, we still have all the same brushes. A good investment!